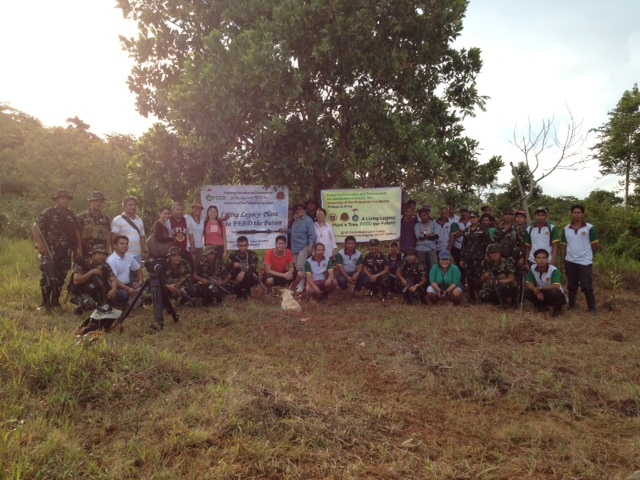 2013 Philippine TV News 5 Raises Awareness on Deforestation | FEED, Inc.
July 10, 2013: Siniloan, Laguna, Philippines. Philippine television channel Rescue 5 is the Emergency Response Unit of News 5 (“Mula Aksidente sa Kalsada…Hanggang sa Bahay mo…Aaksyunan Ora Mismo! Higit sa balita, AKSYON!”), which covers accidents and action responses to such crises throughout the Philippines. Rescue 5 called FEED to inquire whether they could take part in ongoing tree-planting activities with a documentary film crew. Following FEED’s signing of the Tri-Party MOA with the Philippine Army (PA) and the University of the Philippines Los Baños (UPLB) last month on World Environment Day, the tri-party launched on July 10th with Rescue 5 and agro-farmers from the Siniloan, Land Grant Site in Laguna Province, the Philippines under the “LIVING LEGACY: Plant a Tree, FEED Our Future” program. A number of wildlife species in the area particularly the threatened and endangered ones are prone to local extinction if these threats continue to persists. FEED invites individuals and organisations from all walks of life to get involved in the Sustainable Land Use Plan for the Sierra Madre Land Grants.